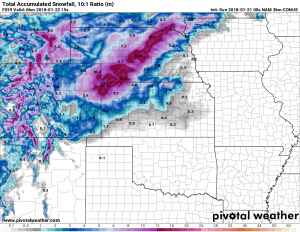 I will just show the latest Nam3k and GFS… unfortunately we are still just a bit far out to get anything reliable from the HRRR. 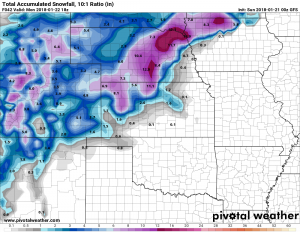 GFS expected storm snowfall total as of 5PM run. As we’ve progressed through the timeline of this storm, models have had quite a bit of consistence on snowfall totals and storm track, but this evening they began to diverge a bit. Is this bad, does it mean the storm is falling apart? Not necessarily! What Does This Mean for the Storm? I attribute this to a bit of late model “bounce” and given other data I see no reason to make changes to the forecast at this time. 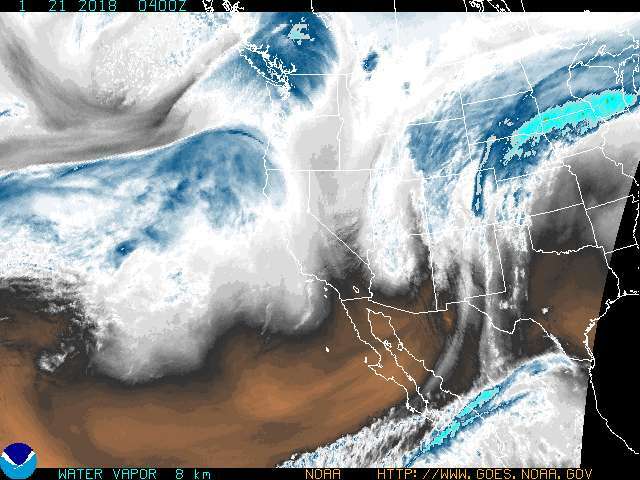 Current position of the trough shown on satellite imagery. The trough bringing the energy is currently over Southern Nevada moving into Utah and pretty much where we expected it to be. The imagery and even some of the models show the storm a bit weaker than we anticipated but there will still be plenty of energy as it makes its way across the 4 corners region. The NWS forecast still shows 5-10 inches of snow for Castle Rock and surrounding areas and we still like that range, but honestly wouldn’t be surprised if our earlier 3-7 inch range is the more accurate. It is possible with weakening of the storm that this area could see that 3-4 inch range we’ve been talking about. The SREF ensembles show a mean of 10 inches… this seems possible but highly unlikely. The SREF is well known for over-doing it sometimes, especially when we get a bit closer to zero hour with storms. I’m writing this off as an outlier right now and will wait to see what it looks like in the morning. When we begin to see uncertainty creeping into models at such a late hour we have to start looking at probabilities. Probabilistic forecasts show you not just a number for how much snow an area will receive, but several numbers and the probabilities behind them. This can give folks a better idea of how likely 5 inches of snow is versus 10 inches. For those of us around Elbert, given our higher elevation and stronger upslope I like the 5-10 inch range better than Castle Rock. So not much has changed from a forecast perspective, expect snow to be heavy at times, roads will be bad for a few hours especially East of Denver and South of Denver. Be prepared to just spend some time at home, it will make an excellent movie day! Please understand though, the hype has run away with some people; this storm will not cripple the city for days. It will not trap you in your house and won’t be a “blizzard” type storm. I’m only saying this because though we’ve called it the “biggest snowstorm we’ve had in over a year” the fact is that any storm with more than 2 inches of snow meets that qualification. This will not be a March 2003 or October 1997, so please keep that in mind. I will have another update as the storm will be ongoing on Sunday morning.